Zoo Lights at the Oregon Zoo is one of the holiday activities we’ve always meant to do, but never managed to actually attend. In Portland, the holiday season is so packed with holiday fairs, parties, and related activities, it’s easy to put off going to things like Zoo Lights or Peacock Lane until it’s too late. This year we had the opportunity to make it to the Zoo Lights earlier in their run. Unfortunately, we were not prepared for the massive crowds and bitter cold that we experienced at the Oregon Zoo. 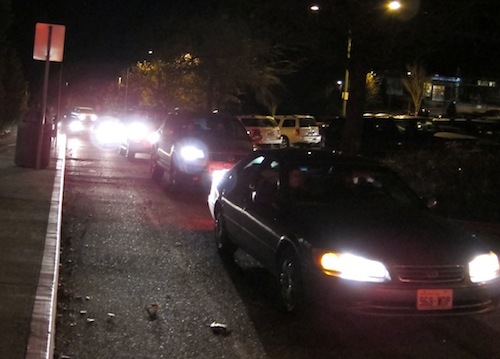 There’s no other way to put it: the parking situation at the Oregon Zoo is a complete mess. There aren’t enough spaces at the zoo for the crowds that the Zoo Lights attracts and the shuttle service to the overflow lots can get so crowded that we heard of people who waited for over an hour to get back to their car. A big part of this mess is that the Oregon Zoo does a very poor job of managing their parking. We spent over a half hour trying to get into the parking lot and get a spot and in that whole time only saw one zoo attendant helping with parking. This parking situation is so bad we strongly advise that if you are going to check out the Zoo Lights at the Oregon Zoo you should absolutely, positively take the MAX train and skip driving there altogether. Parking mess aside, the crowds were reasonably well handled at the ticketing gate and once you are inside the zoo, the crowds aren’t much of an issue (unless, of course, you are planning on taking the train). In addition to being prepared for the traffic, it’s very important to prepare for the bitter cold you may experience even on a rather mild winter night. The Oregon Zoo seems to be located in one of the coldest spots in Portland, and with the wind, a 40 degree night can feel well below freezing. Be sure to wear lots of layers, hats, scarves and gloves because you’ll need them. Beyond the parking and beyond the cold, Zoo Lights at the Oregon Zoo is something rather extraordinary. The entire zoo, and we’re talking a very large zoo, is covered from head to toe in holiday lights. From animal-themed lights to walkways with wall-to-wall holiday lights, Zoo Lights at the Oregon Zoo is a visual smorgasbord. 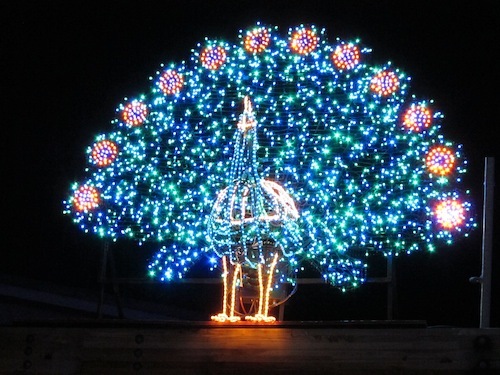 The majority of the light displays are animal themed with a small area with a gingerbread house and a Christmas tree. We were surprised at how non-denominational Zoo Lights are and how much more focus there is on animals rather than Christmas. This focus makes Zoo Lights a truly unique experience. 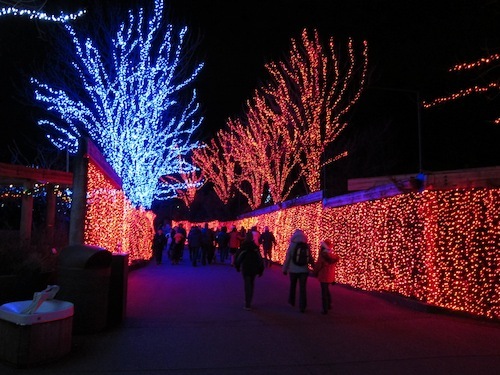 In all, there are over a million lights used in the Zoo Lights exhibit. One thing we were not able to do at Zoo Lights was the train that takes you all around the zoo. The line for the train was consistently an hour or longer, even when we checked back later in our evening. This huge wait time combined with the parking issues really do make it difficult to go to Zoo Lights over the weekend. 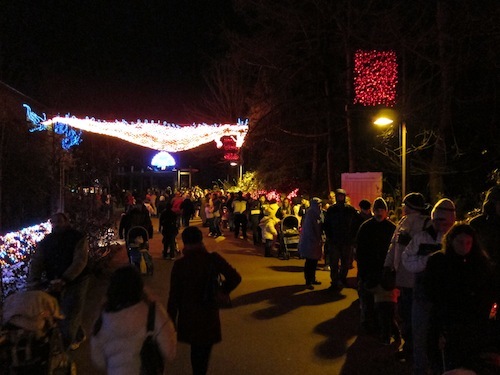 To really enjoy Zoo Lights to the fullest, we recommend going during the week and going at dusk to beat the crowds and get a shot at riding the train. What we loved the most about Zoo Lights at the Oregon Zoo was the huge scale of the exhibit. Everywhere we turned there was something interesting to look at, and the real apex of the exhibit fills the huge green space that is used for concerts. It’s pretty breathtaking. 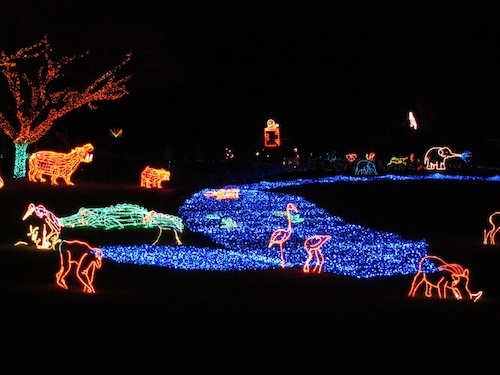 It’s important to note that the focus of Zoo Lights at the Oregon Zoo are the lights and not the animals. While we saw people walking through the exhibits, most of the animals were sleeping (or trying to sleep). 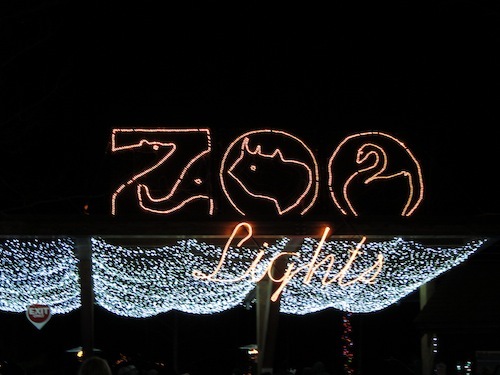 Zoo Lights at the Oregon Zoo runs through January 2nd. Tickets are $9 for adults and $7.75 for children 3-11 (for admission and the train), and it’s well worth the price. More info on Zoo Lights here. Couldn't agree more about taking the MAX. Plus, showing your MAX ticket gets you a discount of $1.50 each. Thanks for the post, Geoff!